Description Dihydroeponemycin is an inhibitor of proteasome and antitumor reagent. This compound is soluble in DMSO. General tips for obtaining a higher concentration: Please warm the tube at 37 °C for 10 minutes and/or shake it in the ultrasonic bath for a while. Stock solution can be stored below -20 °C for several months. In bovine aortic endothelial cells, DNA fragmentation occurred in 95% of cells over a course of a 48-hr incubation with Dihydroeponemycin.
. Meng L, Kwok BH, Sin N, Crews CM. Eponemycin exerts its antitumor effect through the inhibition of proteasome function. Cancer Res. 1999;59(12):2798-801. The proteasome is a member of the growing N-terminal nucleophile (Ntn) hydrolase family, whose aminoterminal side chains act as nucleophiles and free amino groups as proton acceptors. Proteasome inhibitors have been increasingly used to help define the role of the proteasome in cell biology. Dihydroeponemycin labels the catalytic threonine residues of the immunoproteasome subunits LMP2 and LMP7 and the constitutive proteasome subunit X, while epoxomicin covalently modifies the N-terminal catalytic threonine residues of the constitutive proteasome (X and Z) and immunoproteasome (LMP7 and MECL1) subunits. In vitro: Previoius study reports that dihydroeponemycin, an analogue of the antitumor and antiangiogenic natural product eponemycin, selectively targets the 20S proteasome. Dihydroeponemycin covalently modifies a subset of catalytic proteasomal subunits, binding preferentially to the IFN-g-inducible subunits LMP2 and LMP7. Moreover, the three major peptidolytic activities of the proteasome are inhibited by dihydroeponemycin at different rates. In addition, dihydroeponemycin-mediated proteasome inhibition induces a spindle-like cellular morphological change and apoptosis. These results validate the proteasome as a target for antitumor pharmacological intervention and are relevant for the design of novel chemotherapeutic strategies . In vivo: Recent study in the mouse model of dihydrosterptomycin shows that hair cells are targeted because aminoglycosides enter outer hair cells through large mechanically gated channels in the mechanosensory hair boundles. 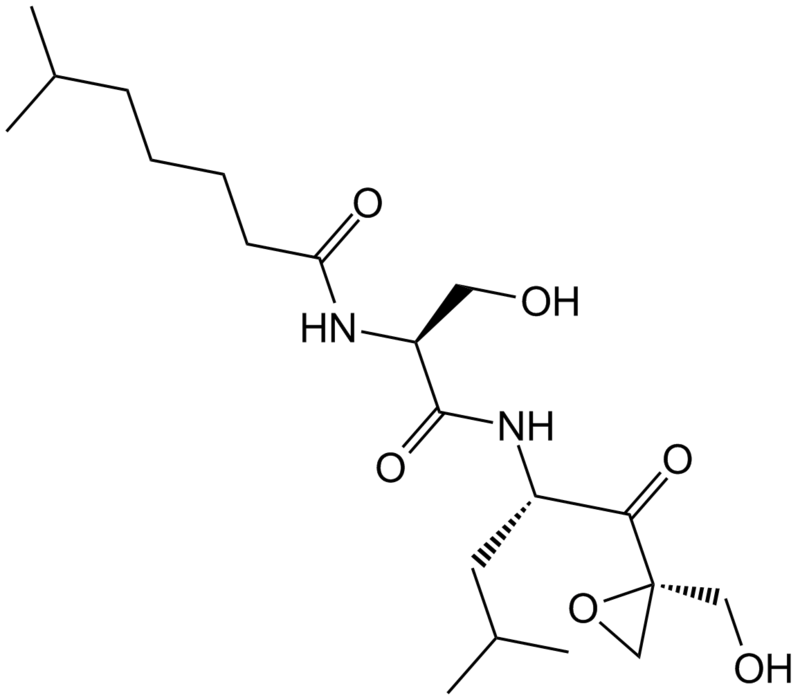 The aminoglycoside molecules then block the channels through which they entered. When this occurs, the aminoglycoside goes through the channel and effectively traps itself in the hair cell . Clinical trial: Dihydroeponemycin is currently in the preclinical development and non clinical trial is ongoing. Kim KB, Myung J, Sin N, Crews CM. 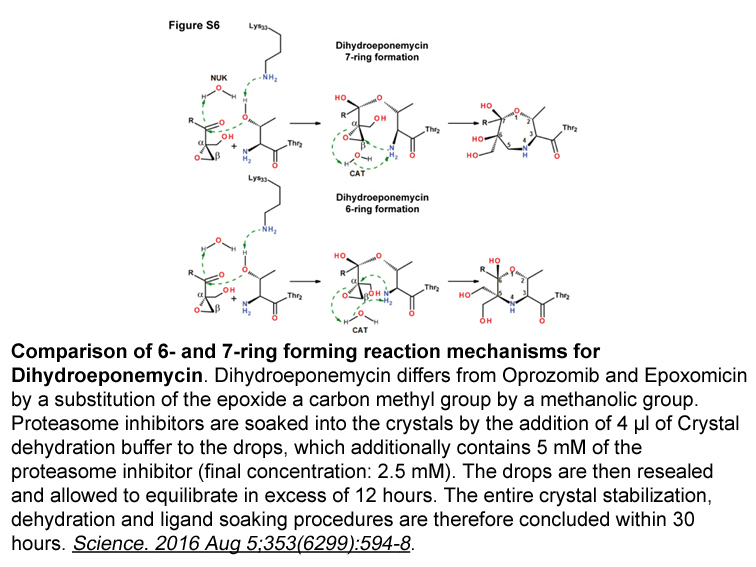 Proteasome inhibition by the natural products epoxomicin and dihydroeponemycin: insights into specificity and potency. Bioorg Med Chem Lett. 1999;9(23):3335-40. Meng L, Kwok BH, Sin N, Crews CM. Eponemycin exerts its antitumor effect through the inhibition of proteasome function. Cancer Res. 1999;59(12):2798-801. Marcotti W, van Netten SM, Kros CJ. The aminoglycoside antibiotic dihydrostreptomycin rapidly enters mouse outer hair cells through the mechano-electrical transducer channels. J Physiol. 2005;567(Pt 2):505-21.